The glassy, smooth look of gel nails has once again caught the attention of both clients and techs. Although the application looks simple, there are significant differences from acrylics, the most obvious being the way the products cure. Here we tackle some of the common problems to achieving the perfect cure. 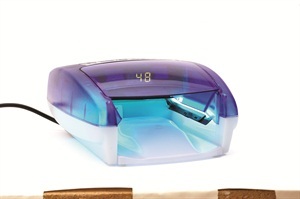 UV lamps intended for drying polish are not an appropriate substitute for a gel lamp. Full-time nail techs should change the UV bulbs every three months (six months if you’re a moderate user, nine months if you’re an occasional user). Don’t wait until you see signs of under-curing. Mark your calendar ahead of time so you know when it’s time to change the bulbs. Creative Nail Design’s Doug Schoon tells us UV rays have a very low penetrating power. Because of this, techs need to take precautions to ensure the entire nail (and all layers of the nail) are exposed to the UV rays. Keep bulbs close to the hand for better curing. “Flash” cure between layers to ensure proper exposure. Make sure the thumb gets full exposure and doesn’t get hidden from the rays. Thumbs may need to be cured separately from the other fingers. Use clear forms so the underside of clients’ nails is also exposed to UV rays. Use thin layers; big gobs of gel will only cure on top because the UV rays can’t penetrate through the thickness of the gel. Any gel product under glitter, flowers, leaves, etc., will have a more difficult time curing because of poor UV penetration. Cure gels layers completely before and after adding a layer of embellishment. Heavily pigmented gels (including pure white) need to be cured completely before adding a final layer and must be cured again after the final layer is added. Do your bulbs need to be replaced? If you encounter these problems, it’s probably time to replace your bulbs. Your bulbs may be perfect, but the product needs time. Consult the manufacturer’s directions to determine proper cure time – and don’t deviate from it. Use a timer, either one on the drying lamp or a digital timer on your desk. Don’t use a wall clock and “guestimate” the correct time. They’re under-cured – now what? If you remove a client’s hand from the light and notice the product isn’t cured, stick them back in to complete the cure. If you remove a client’s hand from the light and begin to finish the nail before you realize it’s under-cured, you need to prepare the nail again. Rough up the surface, reapply the product and then cure the product completely. It’s frustrating when a nail is under-cured and time-consuming to fix it, but don’t sacrifice quality for speed. Today’s client wants it all. She wants a personable, experienced tech, a flexible schedule, and nail enhancements that don’t carry the stigma often associated with artificial nails. She wants a more “eco-friendly” product, one that won’t “damage” her nails, and one that doesn’t have strong odor. And the new client wants art: flower petals, glitter, autumn leaves, multi-color maintain the status-quo, but not if you are trying to grow your business. Techs comfortable with liquid-and-powder application might have a difficult time applying get nails at first. “The hardest thing in going from acrylic to gels is the touch,” says Michelle Lyden, a nail tech at Robin’son Broadway in Hillsdale, N.J. “Using gel is like icing a hot cake. It’s very light touch,” she says. It can be very frustrating at first, she warns, but stick with it. The finished product is beautiful, and it caused her to switch most of her clients slowly over to gel nails. “Gel toes are becoming money-makers, says Yvette Holt, international educator for LeChat. She says gel pedicures are perfect for people who are often in the sand, because the gel doesn’t wear off. Techs can add colored gel, glitter, or other embellishments, and clients will be pleased that the color or design stays beautiful. Plus, the gel is easy to remove and reapply, so clients can have variety of “permanent” colors. It’s the best of both worlds. The gel material, on the other hand is an oligomer. Oli means a few. So, gels are a few molecules strung together – their physical appearance is somewhere in the middle of the powder and the liquid. Because it’s in between moromers and polymers, gel is gooey and stringy. Under the UV rays of the light, the oligomers join together to become a polymer. However, the difference to note is that, unlike a powder-and-liquid mixture, which could take a number of days to cure, UV gels never stop curing as long they are exposed to UV light. This is one reason why UV gel enhancements often become brittle over time.